“I will not fall on my face. I will not fall on my face.” My mantra on June 8, 2016. A 13 year dream come true. 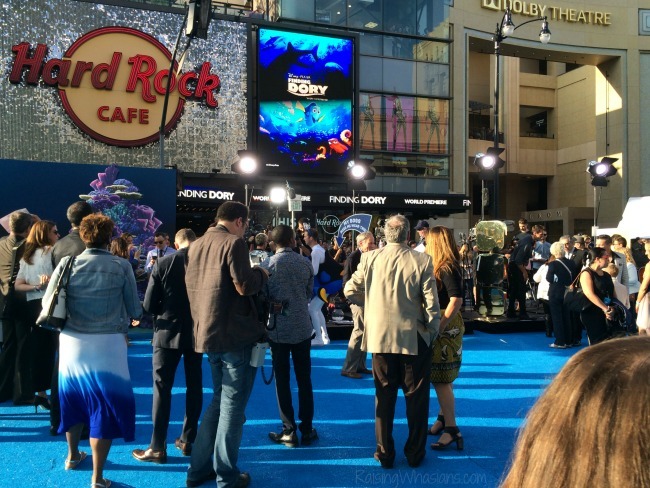 The Finding Dory Red Carpet Premiere at the El Capitan Theatre in Los Angeles, Hollywood. Pinch me. I still cannot believe it happened. 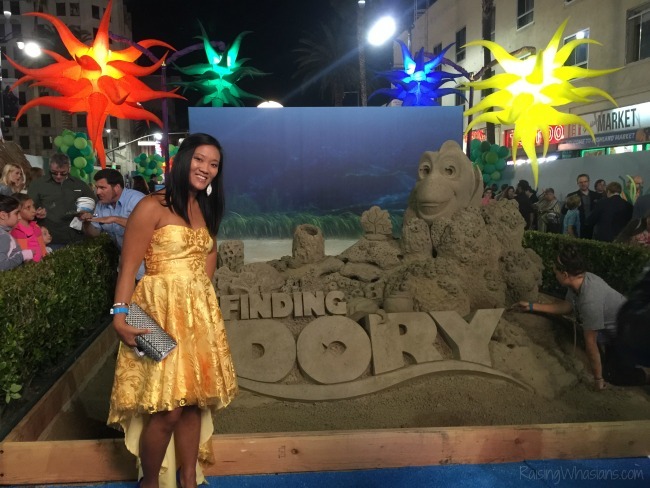 Today I’m sharing my exclusive Finding Dory Red Carpet experience, complete with pictures (ELLEN!) and an amazing giveaway for you! 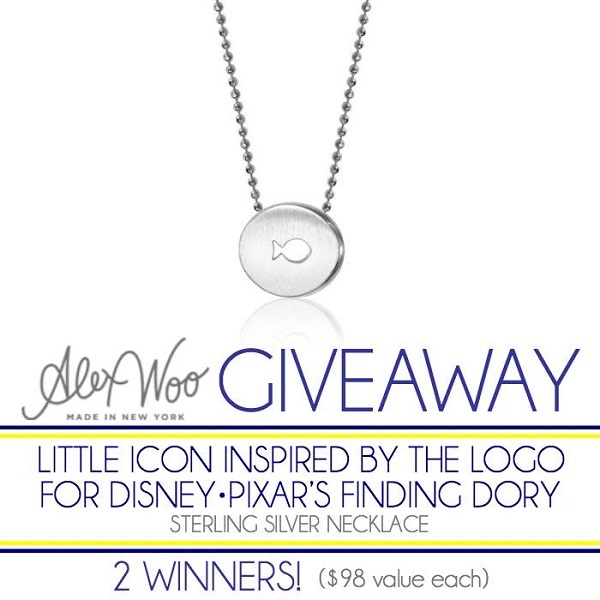 Be sure to check out the fun and scroll down to enter the Finding Dory Giveaway. Every Disney red carpet experience is different. Now having experienced my 2nd red carpet, I 100% believe that to be true. 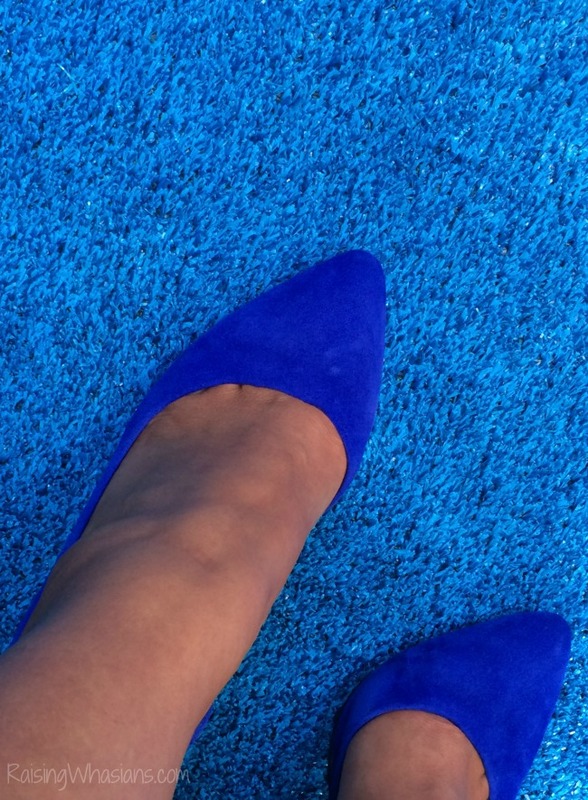 For starters…blue carpet. 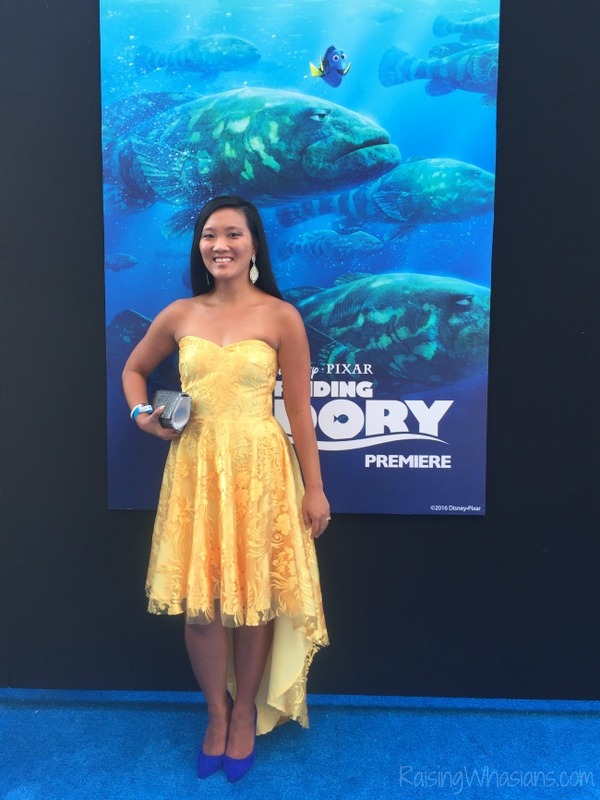 Leave it to Disney to be fashionably forward in their red carpet choices, choosing a fully blue theme for the evening. Thank goodness my dress was yellow 🙂 I was so happy to partner with my high school friend and amazing fashion designer Lall Dass yet again for another custom red carpet dress! Inspired by Dory, this yellow embroidered dress features a beautiful sweetheart neckline and a dramatic high low hemline. The compliments throughout the night from workers, attendees and even stars were so flattering. Spending the night among the stars (and the stars!) was definitely icing on the cake. We just happened to arrive at the time that Ellen and Portia were pulling up. What good timing! I was able to grab a few shots of the famous couple. I love how Ellen made time on the red carpet to take pictures with every single kid along the way. After a quick walk along the blue carpet, we were ushered into the theatre for the premiere screening of the movie….from the front row! WOW! Not only was this the world premiere of Finding Dory, but I got to watch it with Albert Brooks 4 rows behind me and Ellen 6 rows behind me. Ah-mazing! 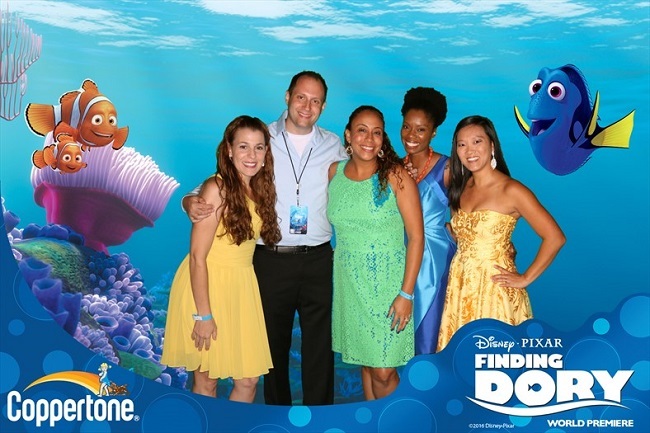 Check out my full Finding Dory Movie Review (including if it’s safe for your kids to see) to get the insider scoop on the story, the animation, the credits and more. No spoilers! 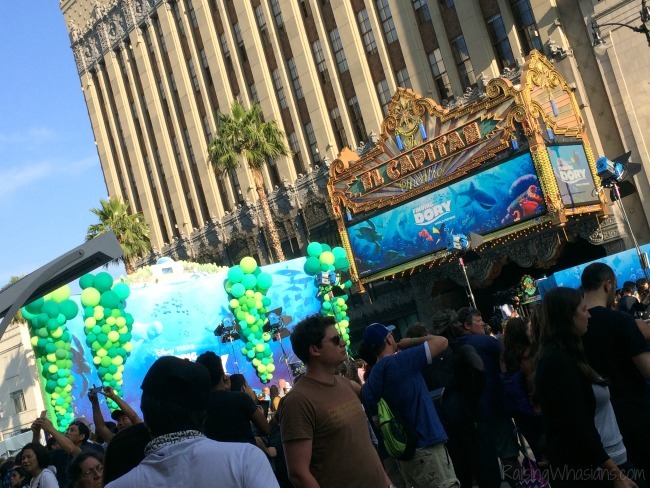 The Finding Dory After Party took place right on Hollywood Blvd. as the red carpet was transformed into the hottest party on the block. Fish tanks, touch tanks, kids’ crafting stations, live bands, photo booths, bubble stations, food stations even a huge sand sculpture (as it was being made) was on display for the crowd. And let’s not forget that this party had everyone there from John Lasseter to Beverly Mitchell. I really enjoyed star gazing (and star gazing, ha!) as we walked along the after party, taking in every single moment. And to be among 25 of the most amazing bloggers and friends, it was an evening that will never be forgotten! 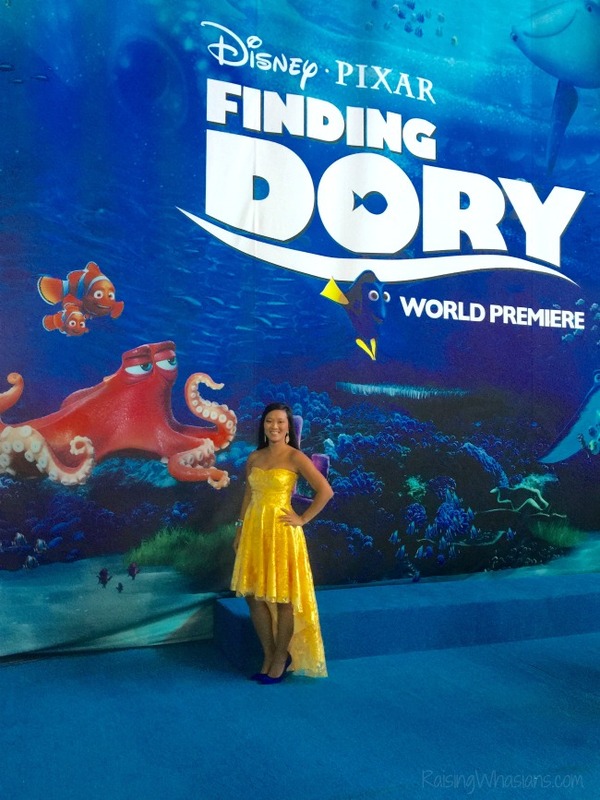 A Disney dream come true, the Finding Dory Red Carpet Premiere was among of the biggest highlights of my career. To celebrate the sequel to my most favorite Disney Pixar film in grand style, I cannot help but to think how blessed it was to spend this night in this way. Make sure to take your family to see the most anticipated movie of the summer! 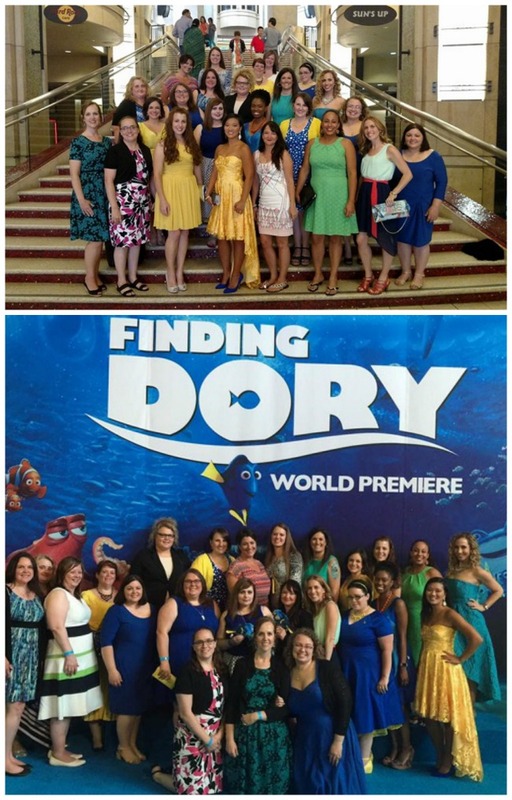 Finding Dory swims into theaters this Friday June 17th, 2016. The giveaway is open to residents of the US only, ages 18 and up. It will end on 6/27/16 at 11:59 PM EST. One winner will be randomly selected using the Giveaway Tools random selector and notified via email. Once notified, the winner will have 48 hours to respond or a new winner will be chosen. This giveaway is in no way associated with Facebook, Twitter, Instagram, Pinterest or Google. Void where prohibited. I was invited to attend an all-inclusive Disney press trip in exchange for this post. But don’t be fooled, my love for Disney runs deep. Be sure to follow Raising Whasians via Facebook, Twitter, Google, Instagram, Pinterest and YouTube for more parent-friendly movie reviews, recipes, crafts and travel. I wouldn’t mind having my prince give me a princess heart necklace. I’d love to have the Seasons Pumpkin. I like the letter jewelry. Like for ones’ initials. i really like the FAITH LOTUS BLOSSOM neccklace! I also like the “cancer” jewelry. I am a cancer survivor!! Thank you for sharing this gorgeous jewelry? Hey I have to go with the Nemo necklace. They would be nice together. Activist Paw necklace is something else I would like. I like the initial necklace. I love so many peices but my favorite is the MINI ADDITION CLUSTER NECKLACE! I love the blue cord from the Dory collection. I would love to have the 14kt Yellow Gold Princess Heart Necklace with 16″ chain. It is beautiful! That is so hard to pick just one. I love the initials, for some reason I love the elephant. No clue why but love it! I love the Little Sea Goat (Capricorn) necklace. The Mom (hearted) necklace!!! But he finding dory one is so cute!! !